The city of Los Angeles is poised to open the first of more than a dozen new emergency bridge housing shelters — one step toward fulfilling Mayor Eric Garcetti's "A Bridge Home" initiative, which aims to build about 1,500 new beds for the city's most desperately in-need homeless residents. The El Pueblo site is slated to open Sept. 10 and will house 30 men and 15 women. The shelter is located across Alameda Street from Union Station, and is corralled into a city-owned parking lot ringed by a freeway on-ramp. The facility, which cost about $2.4 million to build, consists of several subdivided trailers built into living facilities. They're stitched together by an outdoor deck that doubles as a communal space. They don't look altogether different from portable classrooms on a public school campus, or a construction site office. The location also has a pet area where residents' dogs can run and relieve themselves, as well as a communal garden. Though the original goal was to have all the new bridge facilities up and running by the end of calendar year 2018, staff with the mayor's office now say they aim to have the sites at least under construction by July of 2019. Some proposed sites—notably one in Koreatown and one in Venice—have drawn ire from local (housed) residents and business owners who fear the new facilities will attract homeless, causing further delays to the process. Bridge housing is a different model from other types of homeless shelters. Instead of only being open in the evening hours, these shelters never close. Residents live on site, where they have access to showers, medical care and even pet accommodations. The goal is to ensure people can remain in a safe and consistent location while they work to find income, then move out into a more permanent living situation. It's also less expensive — and thus quicker to build — than permanent housing, a single unit of which can cost upwards of $500,000. City officials say they expect residents will be able to transition of bridge housing and into a more permanent living situation (like an apartment, or a rented room) roughly three to six months after they move in. That's contingent on residents finding housing affordable at their often very low-income levels. 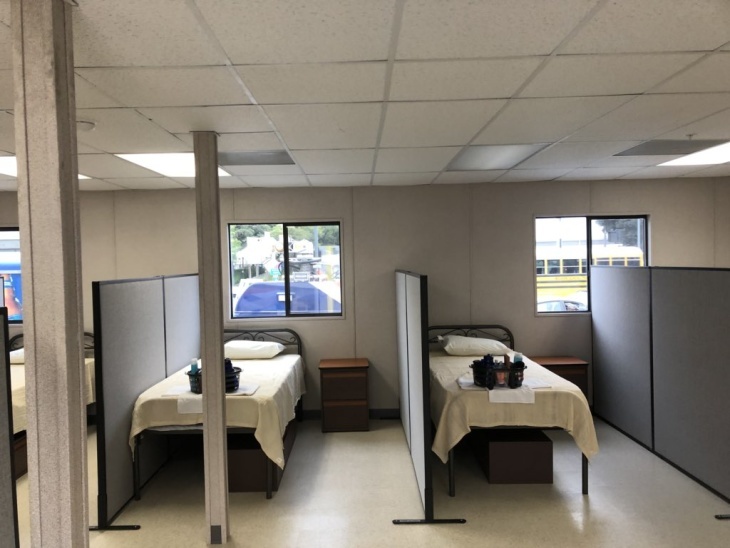 At the El Pueblo location, on-site staff funded largely through Measure H funds will offer mental health services, addiction treatment, career assistance and counseling. It's not a walk-up shelter, and the 45 incoming residents have been selected by the facility's contracted nonprofit operator, The People Concern. Money to build other facilities will be drawn from a $20 million general fund allocation in L.A.'s 2018-2019 budget, as well as an $85 million grant from the state of California. Operation costs will be covered by those sources, and from county Measure H sales tax revenue for homeless services. The areas around new bridge housing sites will also be subject to more stringent enforcement of city rules regarding where people experiencing homelessness can erect encampments. 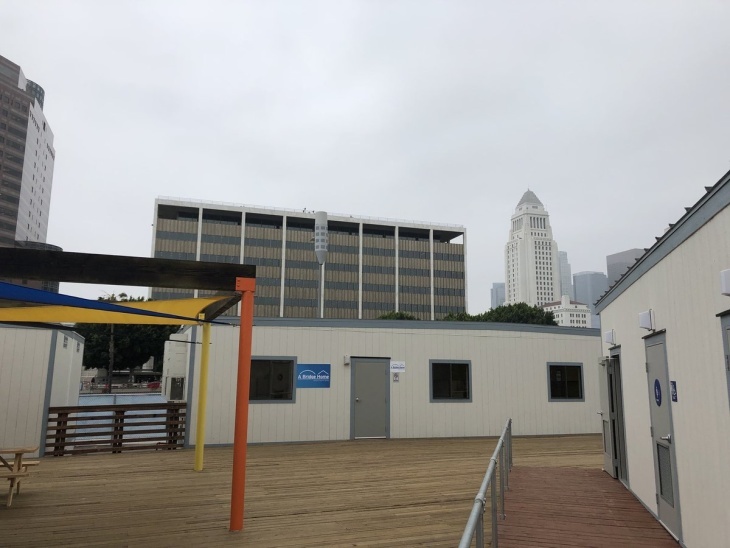 At a Tuesday afternoon press briefing, Garcetti's deputy chief of staff Matt Szabo explained that a so-called "Special Enforcement and Cleaning Zone" will be established around each of the bridge shelters. In those areas, strict enforcement of Los Angeles Municipal Code 56.11—which effectively prohibits sidewalk encampments—will begin one month after a new facility opens. Once special enforcement begins, Los Angeles Police Department officers and the city's sanitation department will be deployed up to five times a week to remove encampments in the area. "One of the biggest sources of pushback we receive when there is a planned facility, whether its permanent or temporary housing, is that residents fear that the location of a facility in their neighborhood will lead to more encampments, more unsheltered homeless, more trash in their neighborhood," Szabo said. "So, we're going to provide the resources to ensure that does not happen." 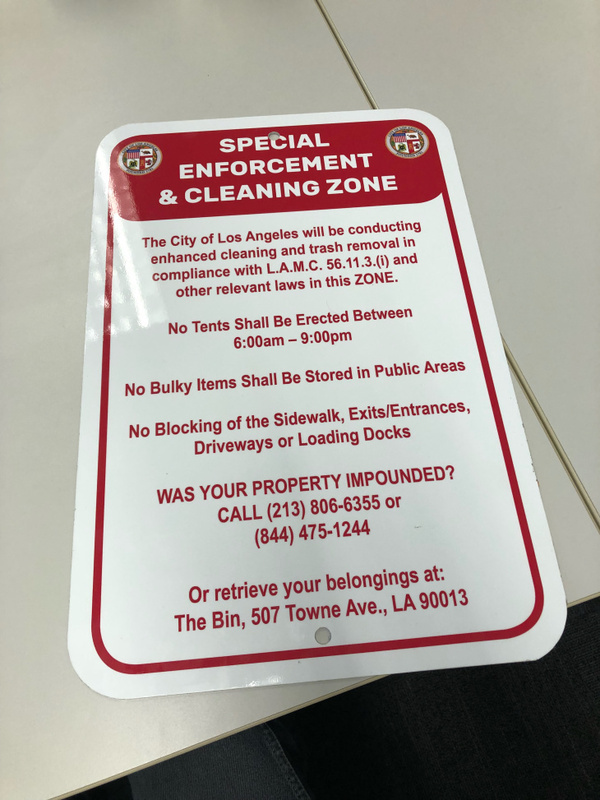 For the El Pueblo facility, the special enforcement zone rings a roughly twelve-block area, bordered by Alameda Street on the west, Cesar Chavez Avenue on the north, Broadway on the east and Arcadia street on the south.